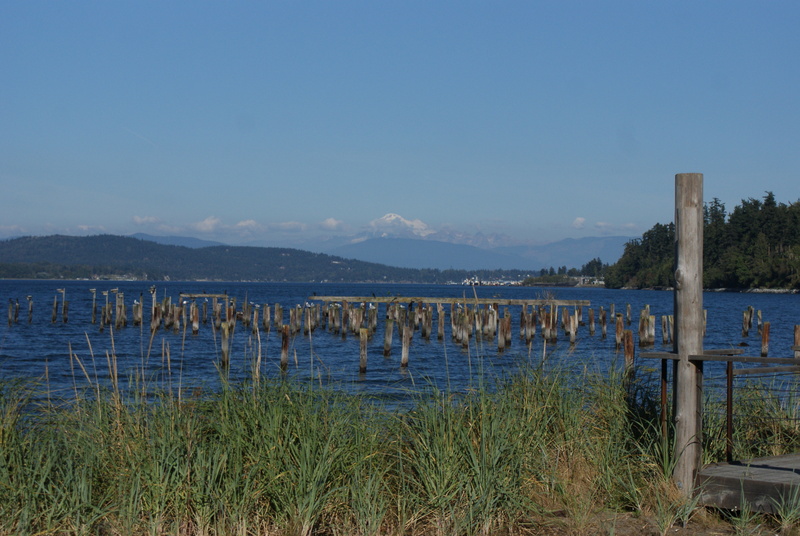 A couple of weeks ago we took advantage of a warm afternoon to hike a new trail to us: Guemes Channel and Ship Harbor Trails up in Anacortes. We found these little gems in Craig Romano’s newest hiking guide for the San Juans and Gulf Islands. Leaving from a cul-de-sac, the trails go off in opposite directions along the shore of Guemes Channel. We decided to do the paved Geumes Channel trail first, walking east along the water. The sun was warm, but there was a breeze from the east that carried the first twinges of fall. 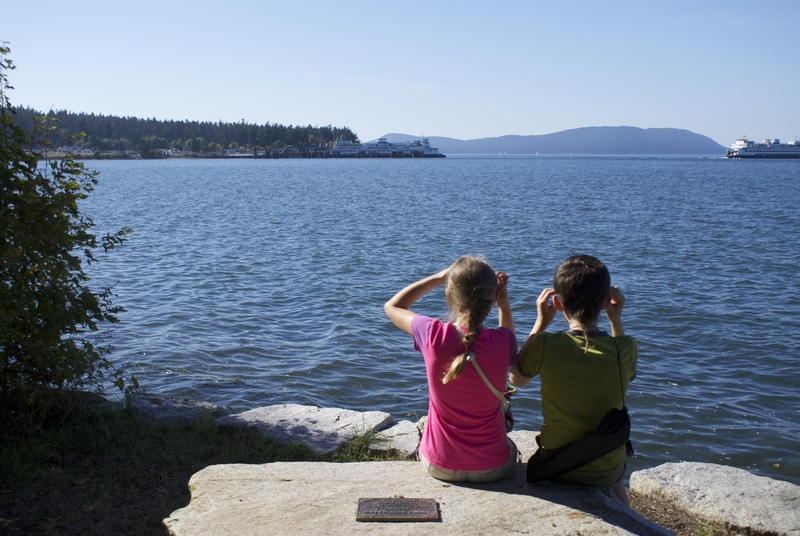 We enjoyed looking out toward the Anacortes ferry, Mt. 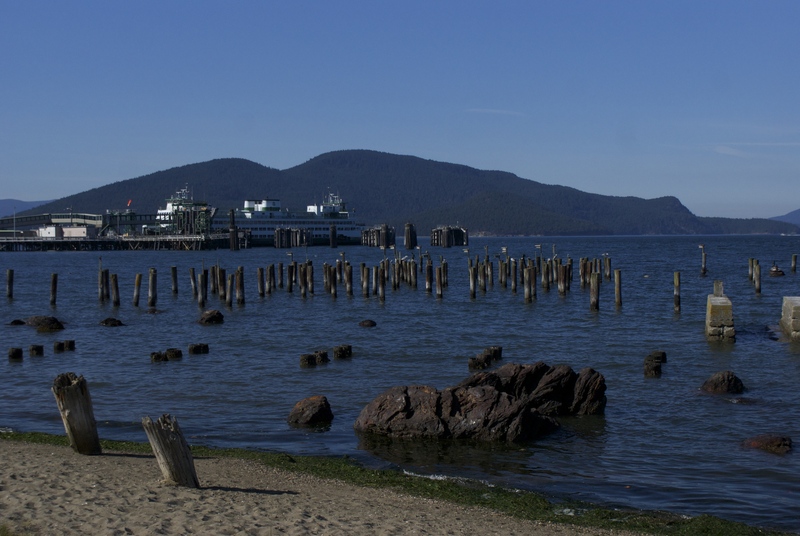 Baker, and the nearby San Juan Islands. 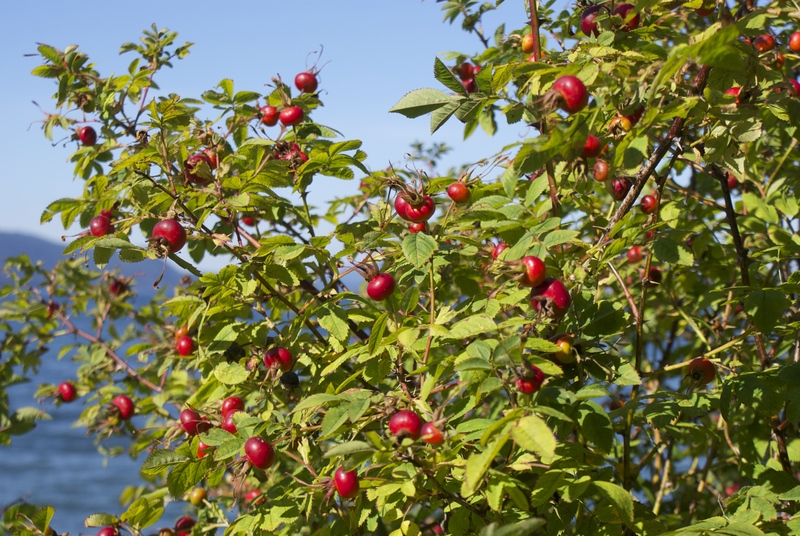 We watched cormorants fish and observed snowberries and orange rose hips. 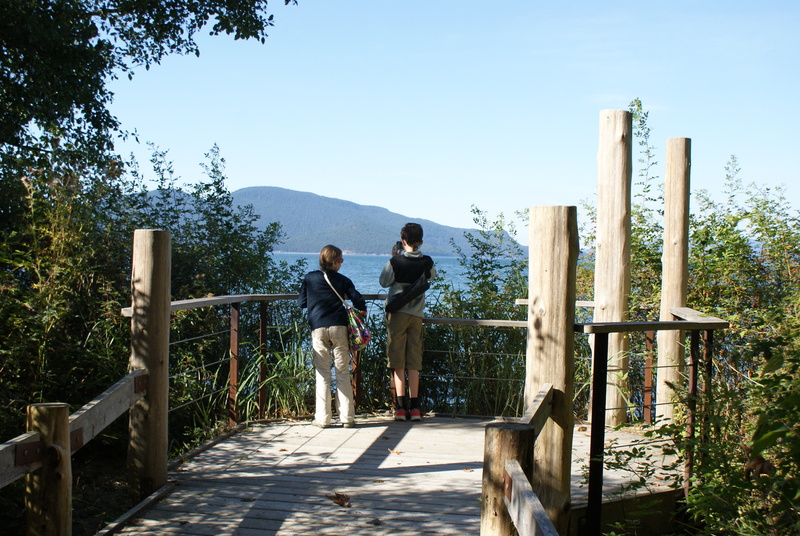 When we reached the end of the trail, we turned back around and explored the Ship Harbor Interpretive Trail. 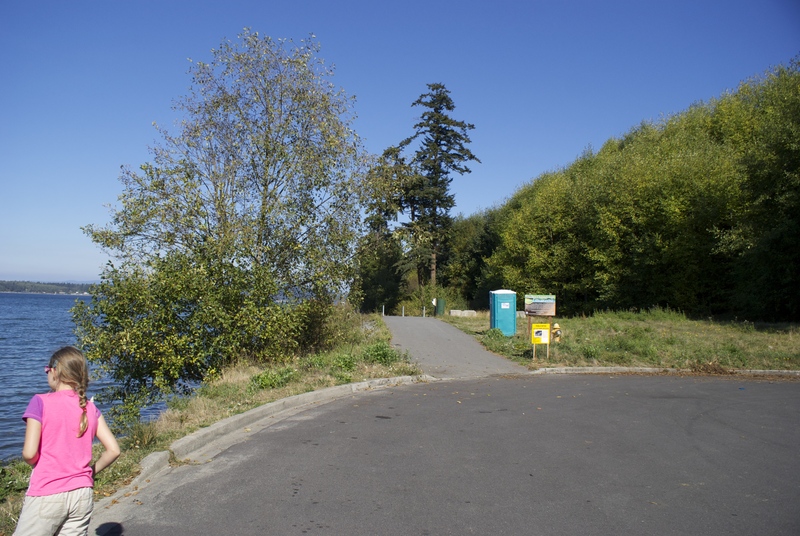 This sweet little trail winds through the wetlands just east of the Anacortes Ferry. Birds flit in and out of the bushes. Bunnies browse the undergrowth. Cormorants and kingfishers rest on the rotting piers leftover from the city’s historical cannery days. This trail has a sandy beach to wander, and plenty of benches and observation platforms to make use of. Lots of folks were out enjoying the sunshine on the afternoon we went. These trails would make excellent destinations for families with young children. We will also keep them in mind for times when we just want to get out of the house but aren’t up for larger trips. Families who are camping at Washington Park or Deception Pass and who want a toddler-friendly trail will want to check these out, as well. 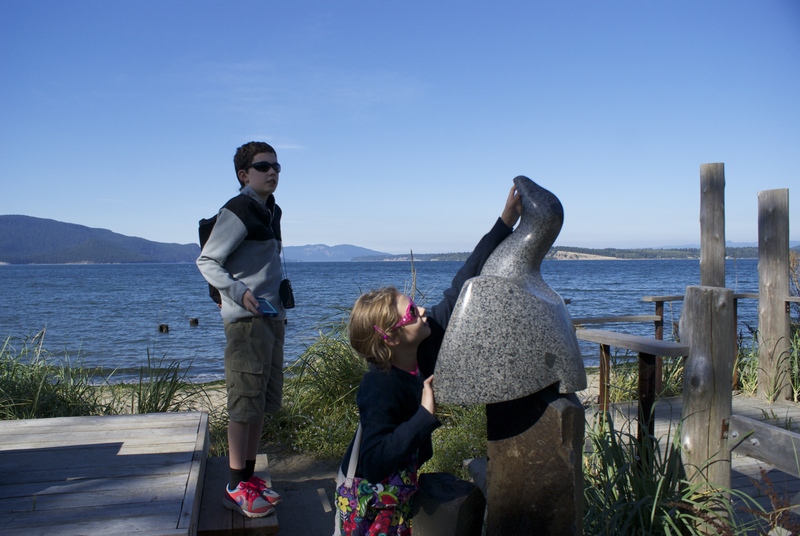 Interpretive signs illustrate local history and interesting ecological facts. We ended our day by playing and relaxing at West Beach at Deception Pass State Park, and watching the sunset. If You Go: The length of the Guemes Channel Trail is 0.9 miles RT, and the Ship Harbor Trail is about 0.7 miles RT. Guemes Channel Trail is paved and flat and has benches to enjoy the view. Local residents are trying to extend the trail all the way to downtown Anacortes. No parking permits are required. There is a porta-potty at the trailhead. Dogs are allowed on a leash. You can get more information about the Guemes Channel Trail on this website. To access the trailhead, follow signs into Anacortes and pretend you are going to the San Juan Ferry. Just before you would turn into the ferry area, look for a newer housing development and Ship Harbor Road. Turn right onto Ship Harbor Road, then left onto Edwards Way. Follow this road to the cul-de-sac and park at the end of the road.